The feature helps you see all your appointments at a glance — and even synchronize your personal calendar with the appointments to avoid scheduling conflicts.If you haven't enabled Online Appointments, see Add Online Appointments section first. Note: This feature is available only to Business Plus or eCommerce customers in the United States, United Kingdom, Canada, and Australia. Customers in those countries can upgrade to either plan at any time. 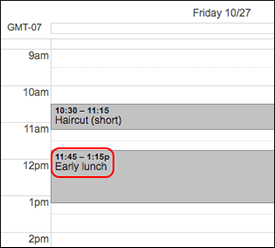 In the top bar, click Appointments and choose Calendar Sync. Click Connect a Calendar, select your calendar service from the list, and pick an account for that service. 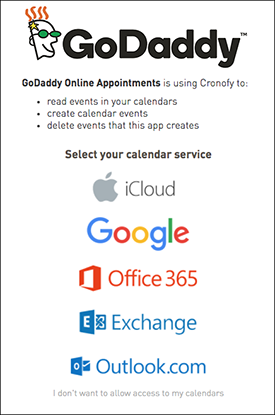 Click Accept when asked to grant Cronofy access to your calendar service. 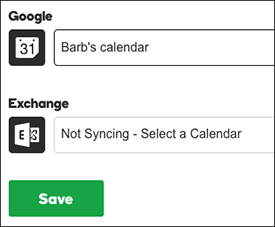 If you have multiple calendars for the chosen service(s), pick one from the menu, then click Save. Note: As the image shows, you have the option of using calendars from multiple services. When the Success confirmation appears, you're done. 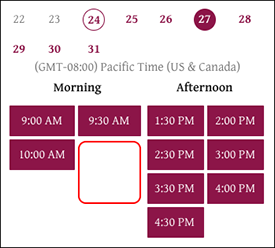 Customer appointments will now appear on your selected personal calendar(s) — and client appointments cannot be made in time blocks when you're busy. Adding a group session to your appointment calendar.